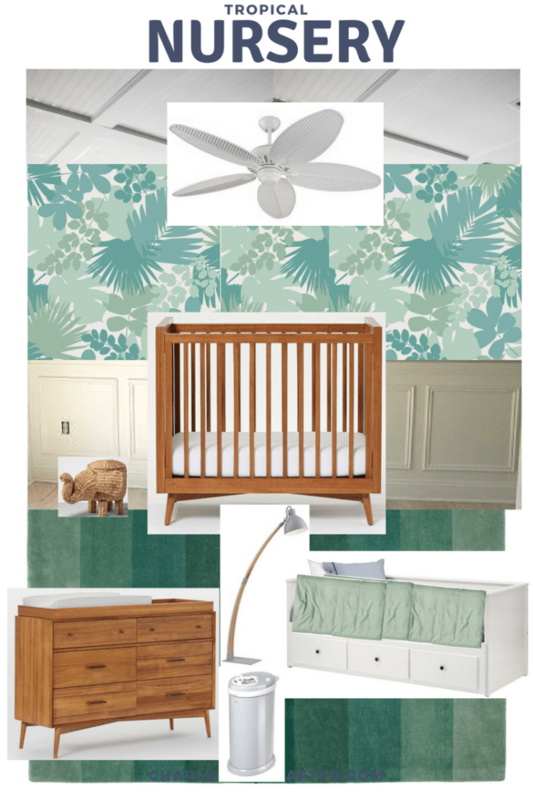 I am so excited to share the design for our nursery with you today. We are going to be turning the room that was formerly known as the office, mostly serving as a junk room, into a baby’s room. I am going for a tropical jungle feel with lots of light and bright accents as well as vintage-inspired furniture. Check out the mood board and all the sources below and I’ll chat a bit more down there! We are planning a few big DIY projects using molding in this space. The room currently has chair rail down the center of each wall and we decided to embrace that and take it up a notch with additional squares of “picture frame” style molding. Additionally, we are going to be doing a headboard and molding treatment on the ceiling. The current fan (it’s so tiny – about 24″ diameter” will be replaced with an upgraded version – you know we need our fans here in the south! We will also be using some simple slats to upgrade the bifold closet doors. Of course the big statement in this space is the tropical wallpaper. I went back and forth between solid green with large canvases, stenciling, and wallpaper. Sean is a bit scared, but I am excited to try out the removable wallpaper trend! It’s in a box in this room as we speak, and will probably be one of the first things we DIY! Furniture-wise, we are not going to have toooooo much in this space. Mostly a crib, a dresser, and somewhere to sit. I was really hoping to keep the existing daybed in this space because I think that having a place to lie down would be amazing, but now that we have it empty I am starting to think that will need to be replaced with a chair. TBD – follow along to see how that one turns out. I am stalking craigslist for a vintage 6 drawer dresser to use as a changing table. I want something that has salvageable wood but since I’m trying to stay under $100, might go with something that needs a paint job if it’s still solid wood and has the right modern lines. We will see. Finally, Sean is planning to build a crib. From wood. He has really grown in his woodworking skills lately and I am so excited to see what he comes up with! The West Elm crib in this picture is my inspiration. We will be 1,000% sure that it meets all of the current safety requirements. I want a large, bold colored rug for this space. I have picked this green one out from Ikea, but we will have to go in person (it’s over 3 hours away) to see if the greens match my wallpaper! So, that’s the design! We are going to share a ton of the process in posts and videos – I can’t wait to share!